Ideal for making putty, distemper and emulsion paint. 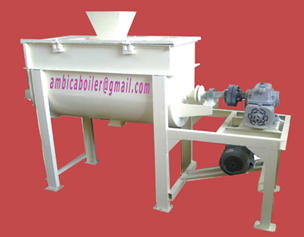 This Pug Mill have Ribbon type blade for mixing materials usually one of them dry and other a liquid. when the material moves to & fro by the action / rotation of screw (Ribbon) blade. Both reverse & forward motions are effected to attain a smooth & pasty finish without solvent loss and raise in temperature. The Pug Mill consist of a 'W' shaped trough with two horizontal shafts on witch several radial arms and interrupted ribbon type paddles are mounted. The paddle/ribbons areas are adjusted to ensure there are no ‘dead areas’ in the Pug Mill. The dead areas in Pug Mill are avoided by making the clearance between the paddle /ribbon blade tips and trough shell is less than one half of the aggregate size. Non uniform mixing can occur if Pug Mill is over filled, the blade tips are immersed in material, the surface aggregates will tends to float above the blade & will not thoroughly mix. Conversely, Pug Mill containing too little aggregates, the tip of the blades rake through the material without mixing it. Normally, the rating is based on percentage of the capacity of Pug Mills 'live zone' . The live zone is the net volume bellow a line extending across the top are of the inside body shell radius with shaft, blades and arms deducted.